The idea of setting up a Rotary Club in Macau was raised for the first time in 1938. However, due to the Pacific War, the idea did not become a reality at that time. In 1946 when Macau and Hong Kong began to recover from the effects of World War II, the idea of forming a club in Macau was resurrected. Henrique Nolasco Jr., a resident of Macau, was invited to attend the weekly meeting of the Hong Kong Rotary Club. He was very impressed by the fellowship and the ideals of Rotary. On his return to Macau, urged on by his enthusiasm, meetings were held with the then District Governor (DG) Arthur Woo and others who gave their assistance and advice for setting up a Club. On 11th January, 194 7, a dinner was held at the Fat Siu Lau Restaurant at which the 36 founding members appointed their first Board of Directors. The Rotary Club of Macau was thus formed and began functioning as a provisional club. Though still lacking official recognition by Rotary International, the provisional club set its course to fulfill the ideals of Rotary by creating ‘The Welfare Fund of the Rotary Club of Macau’ which was to help many worthy causes in our community such as Homes for the Destitute and Aged, the Portuguese Red Cross, the inhabitants of Taipa and Coloane, the Canossian Institute, the Salesian Orphanage, Pang Man School, Kiang Wu Hospital, the Tong Sin Tong Association, primary and commercial schools and the S. Rafeal Hospital Maternity Wing. The Rotary Children’s Library was also set up for the primary school children. On 16th June 1947, the Rotary Club of Macau received official recognition from the Rotary International and was chartered as Club No. 6662 with the then District 57. On 12th to 13th March 1949, Macau had the honour of being the venue of a District Conference which was attended by hundreds of Rotarians from the 12 clubs in the Far East. During the 1950-51 Rotary year, the Rotary Club of Macau had the privilege of having its Past President Pedro G. Lobato elected District Governor, being the first DG from Macao. In this capacity he attended the Rotary International Convention in Detroit, USA. In 1951, as of result of the concerted efforts of all Rotarians united in the ideal of service, the Rotary Club of Macau opened the Lara Reis Anti-Cancer Clinic. 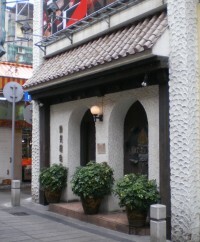 It was located at Sol Poente, Avinade Da Republica Macau. The residence of our late Rotarian Fernando Lara Reis was bequeathed it in his will to the Portuguese welfare organization Santa Casa da Misericordia, which subsequently administered the Clinic. The Clinic is now run by the Macau Red Cross Association. In mid 1951, political changes in China affected all the Rotary Clubs in District 57. Only four clubs from District 57 remained – Hong Kong, Kowloon, Macau and Taipei. Being too few in number to form a district, they composed an area under an Administrative Advisor nominated by Rotary International. The situation was brought back to normal when District 345, to which Macau belonged, was created several years later. In 1988, District 3450 was formed, with Hong Kong and Macau being a separate district from Taiwan. Now District 3450 includes Hong Kong, Macau and Mongolia. The Rotary Club of Macau has been the meeting place for a wide cross section of Macau society, encompassing people of various professions and nationalities. A survey of members indicates that the Club’s members once were made up of 11 nationalities, who could speak a total of 16 languages. This is why, for many years now, English has been adopted as the working language for the Club meetings and proceedings. In the 70’s, the development of Macau led to growth in the Rotary movement here. New clubs were chartered, the Rotary Club of Hou Kuong in 1979, the Rotary Club of Macau Central in 1984, the Rotary Club of Amagao in 1986, the Rotary Club of Guia in 1993, the Rotary Club of Macau Islands in 1997, Rotary Club of Taipa in 2007and now the Rotary Club of Amizade, Macau 2013. The Rotary Club of Macau has always shown a strong awareness of the needs of Macau and has contributed much of its capabilities to meet those needs through community projects. In the 60’s, assistance was given in building a reservoir at the Ka Ho Leper Colony and in building and setting up of fully equipped vocational training workshops at the Boy’s Home which at the time was being run by the Macau Police Force. In the 70’s and 80’s, the Club was involved in the construction of new shower rooms for the orphan’s dormitories at the Sao Jose School in Ka Ho. Many smaller projects have also been carried out including the provision of bus shelters, children’s playgrounds, donations and scholarships to students in need, subsidies to school canteens, old people’s homes and refugee centres, and dental health programmes for students. ‘Preserve Planet Earth’, which has become Rotary International’s motto since 1990, has been implemented in Macau, with our club closely cooperating with local environmental activists, by supporting their purchase of equipment to measure pollution, developing a civic education campaign for keeping the city clean and beautiful and also by organizing tree planting activities. Other community service included shared sponsorship with the International Ladies Club for vans donated to Caritas for the distribution of meals to elderly people living alone. Vegetarian meals were offered to the blind and elderly people at Chinese New Year when ‘Lai See’ were also offered. Special equipment was sent to the Concordia School for the hearing impaired. Since 2000, the Rotary Club of Macau has organized yearly Christmas Parties, in cooperation with the Macau Association for the Mentally Handicapped, for special children and their families. Beginning in 2002, the 5 Rotary Clubs in Macau with the cooperation of the Blood Transfusion Center, have held yearly blood drives. The first Rotary Blood Donation Day on 13th January 2002 saw 88 persons donate blood on that single day. This year the 6th Annual Rotary Blood Donation Day was held on 11th March 2007. In addition to seeking blood donors the event sought to raise community awareness of the need to identify potential Rh D negative blood donors. Only five out of 1000 Asians have Rh D negative blood (0.5%) in contrast to 150 out of 1000 Caucasians (15%) with Rh D negative blood. With increasing numbers of Caucasians in the Macau community, the need for Rh D negative blood can only increase. The Rotary Club of Macau does not only confine its activities to those in need in Macau, it also plays its part in helping the world at large in the true spirit of Rotary International. The Club has taken an active part in the campaign against famine in Ethiopia, in disaster relief in Columbia, Bangladesh and China as well as making contributions to the Polio Plus Program, a concerted campaign of Rotarians all over the world aimed at eradicating polio. In 1997, we donated funds to provide water storage facilities in outlying provinces in China that suffered from a short rainy season and a consequent water supply problem. On the New Year’ s Eve of 2004, just 5 days after the tsunami disaster in South East Asia, the Rotary Club of Macau with the cooperation of DHL and Westin Resort in Macau called for a ‘8 1/2 hour food collection’ campaign. The overwhelming response from the Macau community was the collection of 500 tons of medicine, baby food, biscuits and water. We air-freighted 50 tons off immediately which arrived in Jakarta on the 2nd January 2005. The remaining 450 tons in 30 containers were delivered by sea to Medan. With the help of Rotarians from Jakarta, the collected items were delivered to Acheh in Indonesia. In the year 2000, the Rotary Club of Macau together with the Rotary Club of Kowloon North, the Rotary Club of Taipei North, the Ama Rotary Club in Nagoya, and the Macau Catholic Social Services, built three primary schools in remote mountain villages in Du’An, Guangxi province. In the following years, more rural primary schools were built, with dormitories equipped with beds and mosquito nets, playgrounds and reservoirs. In addition, working with our Rotary partners, we completed an unfinished teaching building, built a fully equipped Experimental and Technical Building as well as new student dormitories for the Experimental Middle School in Du’An. We also provided the school with facilities for a multi-media classroom and a hundred computers for the computer room. Thus far, we have built a total of 6 primary schools and a middle school in Du’An. We have also furnished and equipped a kindergarten and are going to build another primary school with our project partner, the Rotary Club of Kowloon North. We have also arranged for secondary students from Macau to have cultural exchanges with students in Du’An. Our Rotaractors also have helped raise funds for the school fees, stationery and books for the students in Du’An. Last December, students from the University of Macau also joined our trip to Du’An and helped rural primary school students develop their creativity by teaching them to make drawings and hand print paintings and organized games for the middle school students to help build their confidence. We have been providing oral health education and oral check ups with assistance from dentists in Macau. With the purchase of the new mobile dental units, students and villagers will also be provided with dental treatment. Our Club is honored to have 38 Paul Harris Fellows and 4 Benefactors, who have made contributions to the Rotary Foundation. Through the Rotary Foundation, the Rotary Club of Macau has sponsored promising young men and women to further their studies abroad in order to better serve Macau on their return. In 1978, Dr. Alfredo Ritchie was awarded an Ambassadorial Scholarship to study endoscopy in the USA. On his return, he was a pioneer of this technique in Macau and later became the head of the Endoscopy Department in the Macau Government Hospital. Dr. Ritchie became a Rotarian in 1983 and was President for the years 1987-88 and 2001-02. Another scholarship was awarded to Dr. Tito Lopes who went to Australia to specialize in geriatrics, a specialty much in demand in Macau. In 2002, our Club sponsored Dr. Mok Toi Meng, who went to Melbourne as an Ambassadorial Scholar and furthered her studies in the field of cardiology. This year, we have sponsored another Ambassadorial Scholar, Ms. Sonia Wong from Macau, who will study for a Master’s degree in the UK. With the increase of females in the professional world, our Club inducted its first female member in 1992 and by this year our Club has 12 active female members. Of these 12 members, three have been Presidents of the Club. Stella Kan became the first female President for the Rotary year 1996-97, followed by Synthia Chan in 2003-04 and Fatima Ferreira in 2004-05. The Rotary Club of Macau maintains a strong relationship with our Rotaract Club, and our sister club, the Rotary Club of Bangkok South. We maintain strong friendship relationships with the Rotary Club of Kyoto Nishiyama, and the Rotary Club of Makati North. For the past 60 years of charitable endeavors the Rotary Club of Macau has served Macau and the international community and will “Lead the Way” to better serve locally and internationally in the future.